The fact that the West Side Market is still working efficiently is a testament to its designers and builders. Most of today’s buildings are of the throw away kind – put ‘em up, rip ‘em down in 10 – 20 years. Just the opposite of “sustainable”. 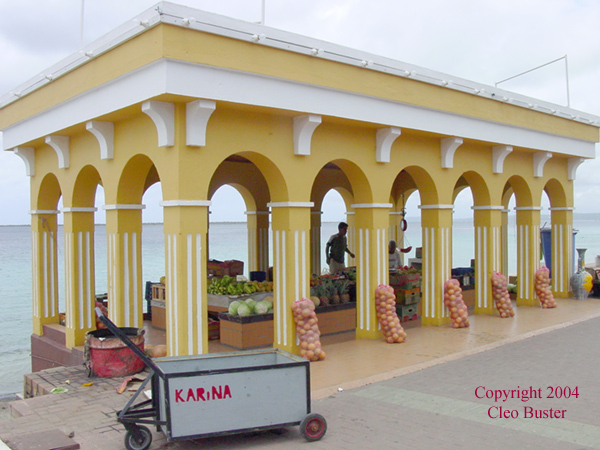 The photo above is of a quayside fresh market in the capitol of Bonaire, one of the three islands in the Dutch West Indies. Our family visited the island a few years ago and we bought fruits we knew, and many with which we were unfamiliar. Because Bonaire is exceptionally arid, almost all the produce comes over by small boat from Venezuela – and when the boats go back they have plastic 55 gallon drums which they fill with seawater and put down in the hold for stabilizing ballast. This market place is almost the only source of fresh vegetables on the island so all the restaurants and town's people shop here. Though a smaller building overall, the scale of the arches, and the concrete and tile building materials have much in common with the West Side Market – don’t you think? Anyway, it is a nice counterpoint to late winter in NEO! Submitted by Jeff Buster on Sun, 03/12/2006 - 20:15. I wanted to credit my daughter for the photo but it came out so big it looks obnoxious. Photoshop has so many ways to post to the web in Gif, jpeg, etc. I've been experimenting with image quality vs. file size. I took a 4.3 megapixil file and reduced it to 170kbts and it is still clear. Pretty amazing. Submitted by Norm Roulet on Sun, 03/12/2006 - 20:35. Jeff, I always appreciate you posting great photos. One nice thing about the digital world is it is so rich in multimedia, and we need to better exploit that as a community and on REALNEO. As for how to format images, as a general rule, I save them for the web as jpgs and make the image width no more than 400 pixels - I usually crop first, to get the image tight, and then resize to 400 wide by whatever height... I do all this in GIMP - I also think it looks best if the pictures are centered, or inserted in a table, which is a bit more complex. Do feel free to play around with the format. We have a new tech guru so he'll update and enhance lots of image and video capabilities that we'll all enjoy on realneo and in NEO.